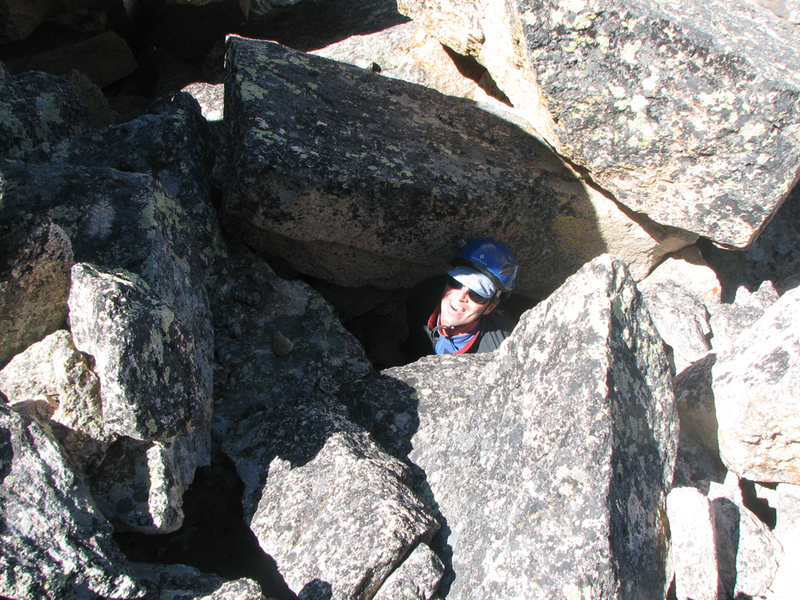 The Grand Mogul is a Sawtooth icon with a really fun couloir. 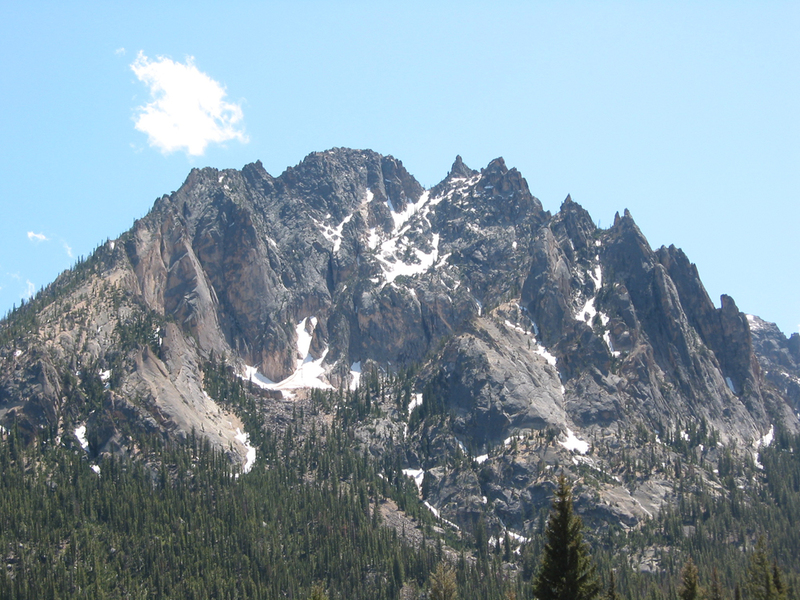 The Grand Mogul sits smack-dab at the end of Redfish Lake, so although you might not know it by name, you've probably seen it. It had been on my list forever, so when Kevin invited me to join him and Greg, I called up Tom and we had a foursome. 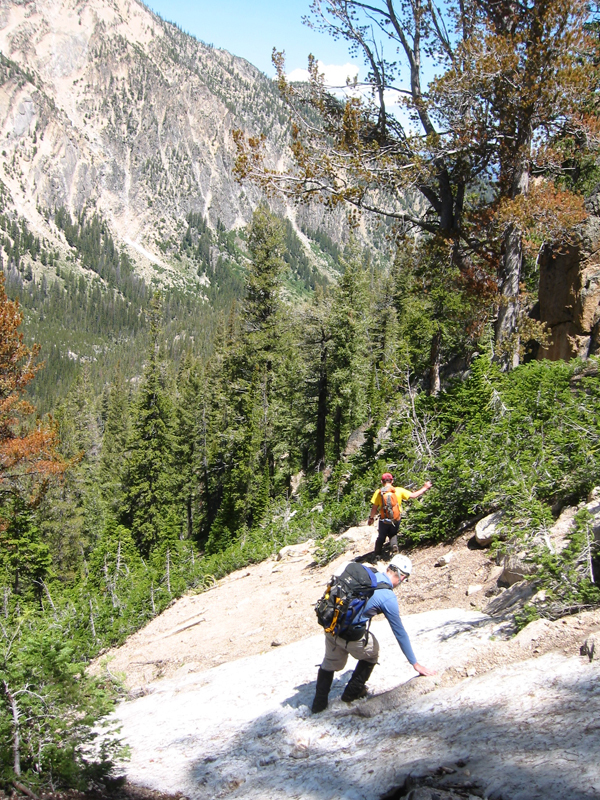 Greg had done this route many times, so it was like climbing with a guide. 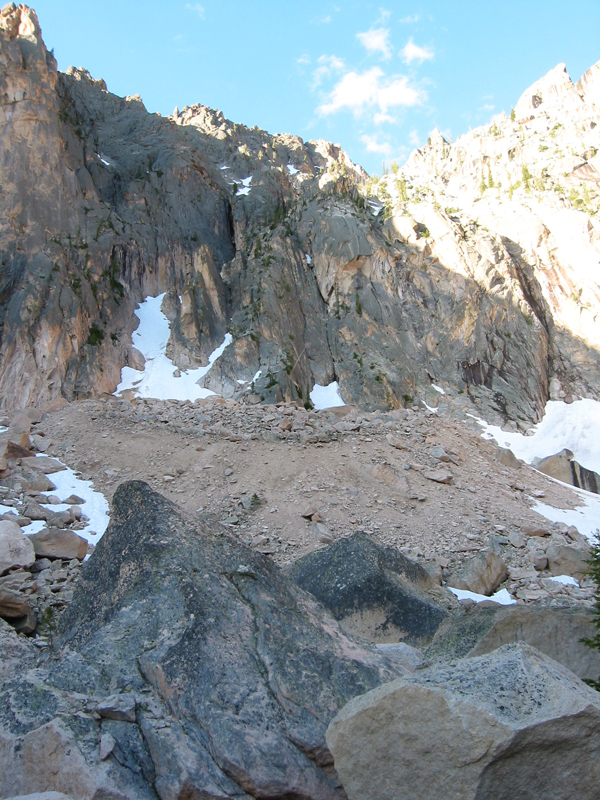 As in the picture above, the couloir isn't always obvious because it goes behind a large buttress. The patch on the upper left is the entrance. Tom was way ahead of us for most of the approach, and he stayed that way on the climb. Monday is his birthday, and I think we should all chip in to get him a bigger pack. It was obvious that there had been lots of rock fall here. Tom was without helmet, so he gladly went first. 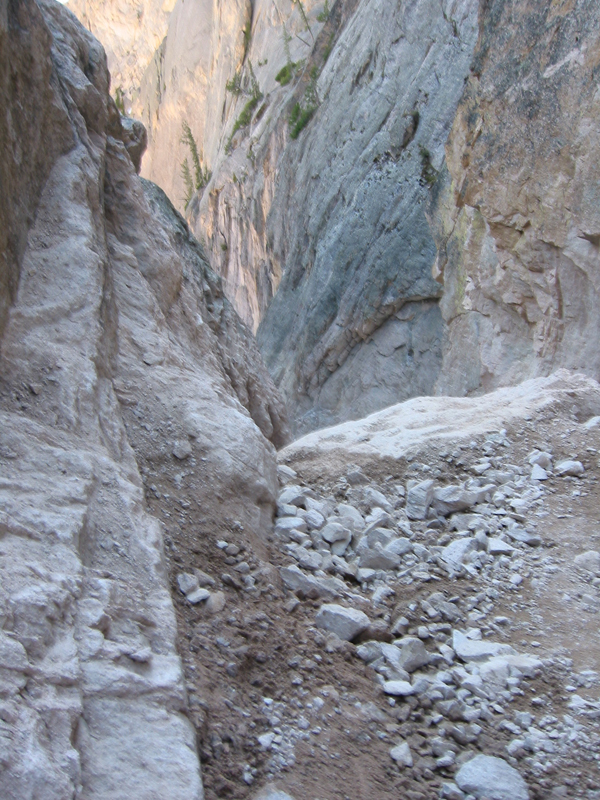 Here you can see the couloir opening up a bit, but the chockstone for which the route is named is not yet visible. Tom was already exploring under the stone when I arrived. This is Kevin and Greg coming up behind me. 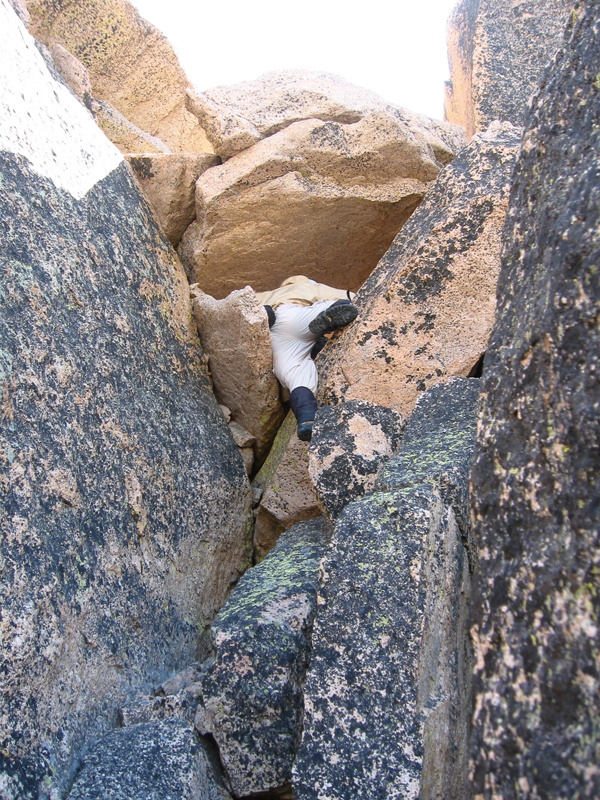 Getting around the chockstone (and its associated debris) is the crux of the climb. 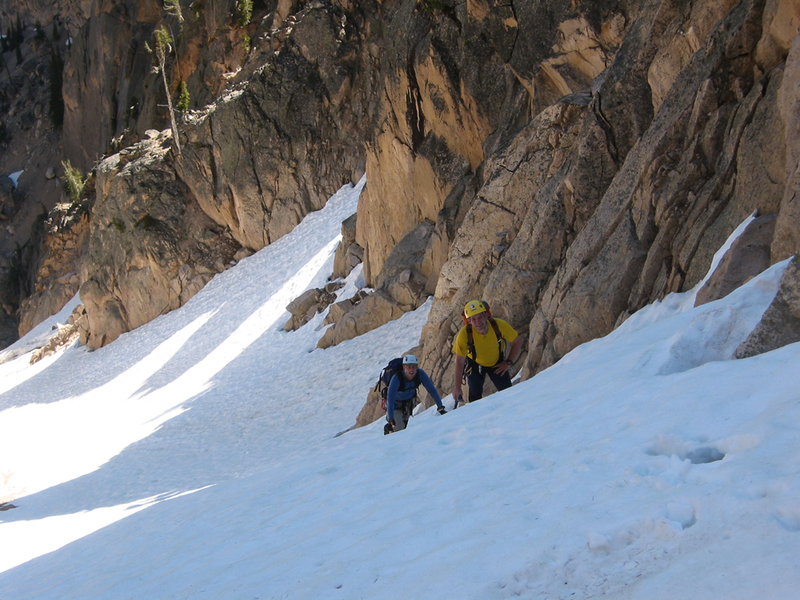 Depending on snow level, the difficulty varies. Here Tom chimneys up the second rock, which he then traversed. 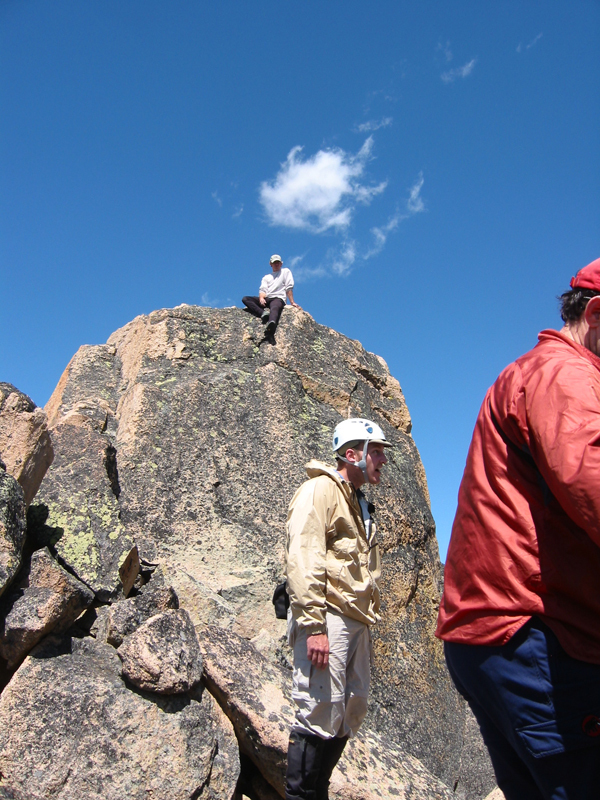 Kevin put a picture on Summitpost of me feeding rope to Tom after he got over the boulder. The chimney was actually easy. But above here, the climb is wet, sandy, rounded, and awkward. Yummm. When you get above the chockstones, this is what you see looking down. Right underneath this section, Kevin and Greg are trying to climb. Up looked much more appetizing. We did see some substantial rock fall. 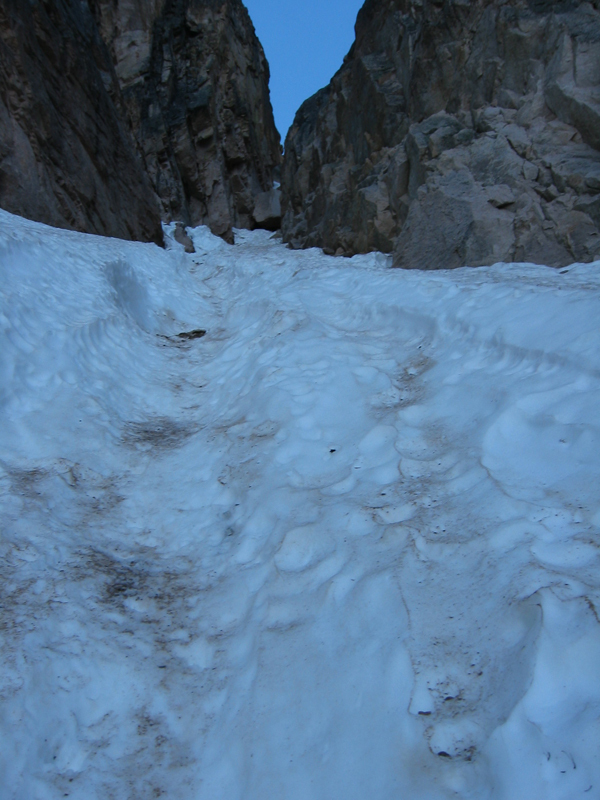 Tom and I were high in the couloir when we heard the warnings. 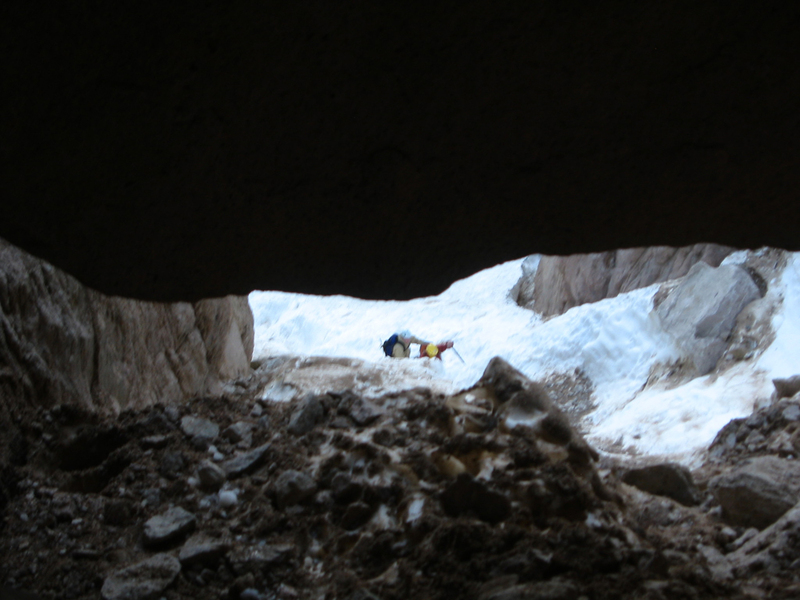 They were coming from an adjacent gully (we didn't do it, honest) and then we saw them- football and beachball sized rocks bouncing and careening down the couloir. 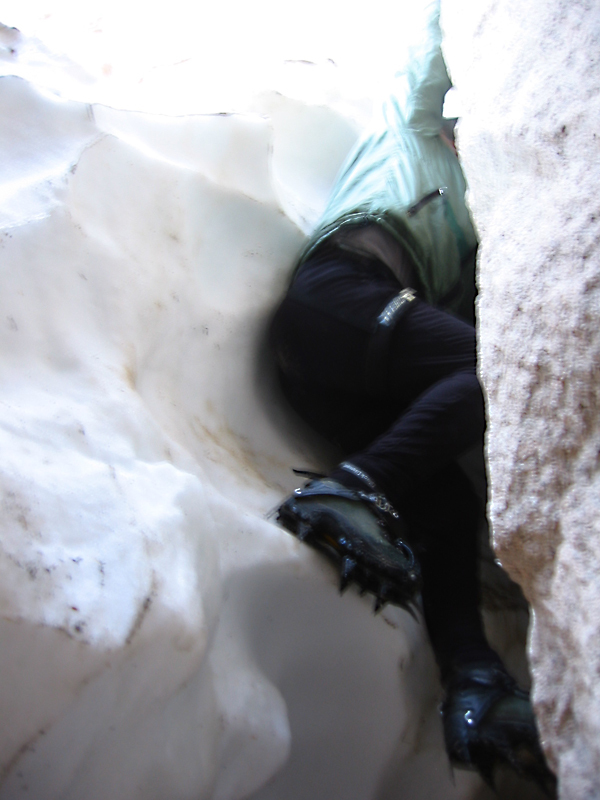 Fortunately, Greg was staying on the other side of the couloir and no one was hit. Here Greg and Kevin are about to top out the couloir. 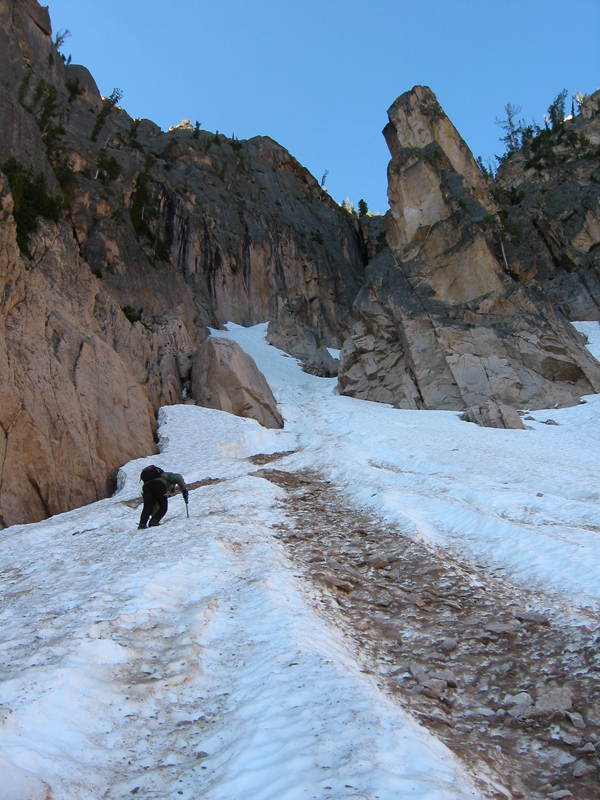 From where you leave the snow, it is about 300' of scrambling to the summit. Greg, who has been up here "more times than I care to count," showed us this cool route with tunnels. That's me after climbing up about two body lengths. Best leave yer pack at the saddle. Here Kevin is going through the big one, which is really just crawling under a chockstone. The little one was like crawling through a twisting, vertical rabbit warren. When we got to the summit, there was a crowd. The family of Jon Francis, a young man who was lost up here last year, is still looking for his remains. We chatted for a few minutes. Tom bouldered on the summit blocks. 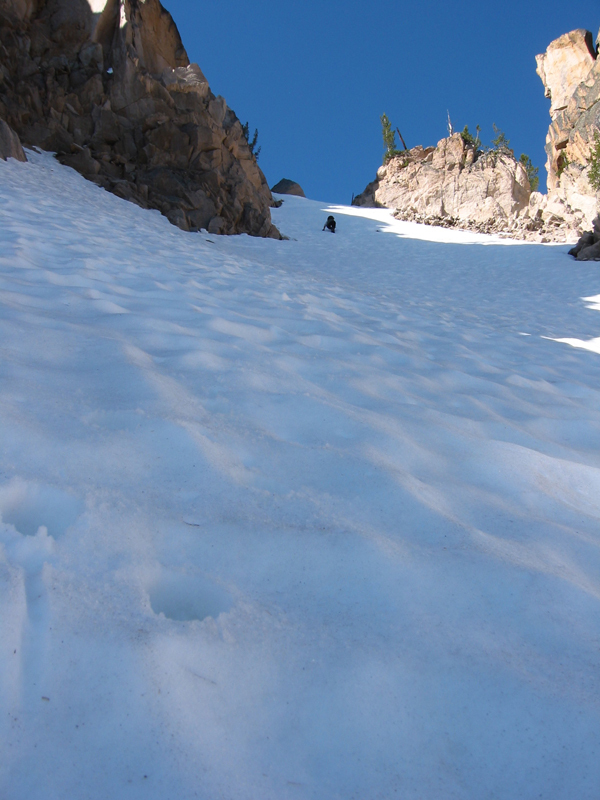 Then Greg showed us his preferred descent route, dropping down the backside of the saddle at the top of the couloir and going clockwise around the base of the mountain. Part way around, Tom and I made a beeline for a very cold wade of Redfish Creek, but Kevin and Greg beat us back to camp. We rushed down to catch the 3 o'clock boat, only to find it full. We only waited a short time before were were back to Redfish Lake lodge for burgers.